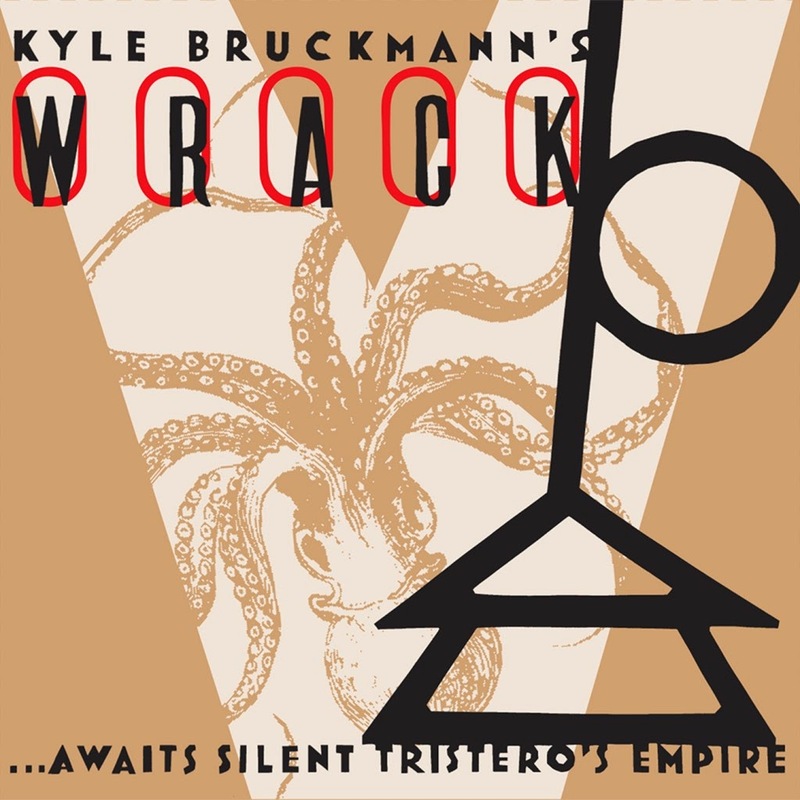 Kyle Bruckmann -- a classically trained oboist, spiritually a punk and free form improviser -- has, with his free form group Wrack, unleashed a free wheeling and wildly diverse conceptual album called "... Awaits Silent Tristero's Empire," influenced by the novels of Thomas Pynchon. The title itself comes from Pynchon's "Crying of Lot 49," a novel about a rivalry between two mail distribution companies. Tristero was the organization forced to go underground, hiding it's mailboxes in trash bins, identified only by a symbol of a muted post horn with a loop. The eccentric and brilliant book may give an idea as to the music on this album, which throughout its four tracks displays a vast range of musical genres and sounds but is cohesive. From circus music to vaudeville, swing to hard bop to free jazz, Bruckmann and his band skillfully execute all the various styles to create a musical world that reflects the music that would have been played in Pynchon's books. "Overture," begins with a horn introduction, before exploding into a free form exchange between percussion and the horns, the trumpet providing a carnival like solo, as if preparing the listener for the circus show to follow. The remaining tracks are titled after three of Pynchon's novels. "Part One (V)," begins with a Harlem swing style horn playing, full of swagger, before switching over to a vaudeville like showtune, with an oom-pa-pa like rhythm. It evolves to a swinging hardbop tempo, with a trombone solo backed on the beat with emphasis by the other horns. The one constant is the switching of styles, modes and moods, and when broken down like this it may seem disjointed, but in execution the music is strangely engaging and thought provoking. "Part Two (The Crying of Lot 49)," leads with a bass solo, then accompanied by a violin then drums in a slow moving and tender trio piece, before abruptly switching to a horn led funky bop theme, dominated by a wonderful solo by the bass clarinet, before moving into a faster, freer improvisation. This is the standout tune on the album, evoking those familiar styles without adhering to any one of them, an effective work of deconstruction. "Part Three: Gravity's Rainbow," returns to some of the themes established on the first two parts, alternating from the swing of Part Two and the vaudeville of Part One, before engaging in a very long free form Sun Ra like improvisation, then settling into a calm string duets, later joined by all in a soft but high pitched coda. "Awaits Silent Tristero's Empire" will appeal to many who are in search for something different in contemporary music. The improvisations, the creativity and execution are stimulating and appealing. While those who know Thomas Pynchon's novels will get a deeper sense of appreciation for the music -- there are references to an Ornette Coleman and a Gerry Mulligan like musicians in his books -- those who haven't read them will find themselves immersed in a strange yet exciting world of mish mash improvisation and creativity. Recommended. Kyle Bruckmann (oboe, english horn), Jason Stein (bass clarinet), Jen Clare Paulson (viola), Anton Hatwich (bass), and Tim Daisy (percussion) joined by Darren Johnston (trumpet) and Jeb Bishop (trombone). Bruckmann (oboe, english horn), Jason Stein (bass clarinet), Jen Clare Paulson (viola), Anton Hatwich (bass), and Tim Daisy (percussion) joined by Darren Johnston (trumpet) and Jeb Bishop (trombone). Nice review and a highly addictive album! Piece of trivia: Pynchon, being as erudite as only he can be, often includes characters based on real persons in his novels. His first novel, "V.", involves a jazz musician named "McClintic Sphere" that is, for all intents and purposes, a fictionalized version of Ornette Coleman. Also worth noting is that "Sphere" was Thelonious Monk's middle name. So you see, a certain connection between free jazz and Pynchon was always there. Great record, I'd go as far as to say that it's one of the best I've heard this year. Bruckmann and Pynchon, that's seemingly a perfect match.